Maghaberry is an injustice that undermines the very fabric of our society, no man or woman should be subject to what goes on in this hideous place. It should be an international outrage but instead is for the most part ignored by those with the power to effect change, those who have bought into the new establishment in Ireland. Whether for good or bad, for right or wrong, they’ve bought into it all. And the ‘all’ in question does not just equate to power-sharing, the equality agenda or any other ‘positive’ relating to the ‘new dispensation’, it also involves Diplock Courts, internment, secret evidence, political policing and the torturing of Irish political prisoners - prisoners such as Gavin Coyle, who has recently entered his fourth year in solitary confinement. By any definition that amounts to torture. 23 hours a day on your own is mental torture. Those who sit in a government at Stormont that permit this need to examine their conscience. For years they’ve trotted out the bogus line ‘Raymond McCartney’s working on this behind the scenes’. Well what has he achieved? Raymond and his party would do well to remember how this approach was rejected by none other than themselves when trotted out by the Catholic Hierarchy and the SDLP during the Blanket Protest. If it was considered an unacceptable line 30 years ago then how can it be seen as any different today? It is a token line and a token approach, a point best illustrated by the fact there is no change we can point to that suggests this argument has any merit. Gavin Coyle is over 4 years in solitary confinement and will no doubt see out his time in the same condition. That this doesn’t register with the powers-that-be, with those who claim to represent us, speaks volumes about their participation in the British system. They told us they were going in to create meaningful change but it seems the only thing changing is their bank balance. There is a responsibility on those who participate in this system, and legitimise it by their presence at the heart of its institutions, to ensure the brutality ongoing at Maghaberry is given no place or quarter in this society, the beatings, the abuse, the horror has to stop. It has no place in our country today - it never had. If what goes on behind those gates were carried out in some dictatorship no doubt we’d hear the great and the good speak out, it would be condemned vociferously and rightly so. But not here, not in our own country, not when it is done to and on our own. Why do we never hear this alluded to by our politicians, why is this brushed under the carpet, why do they not want us to know what is being done in our name? The time for action is long past, those in positions of authority, who have achieved high office on the back of a mandate given them by the Irish people, can no longer sit back as though this were not happening. They can no longer watch on through covered eyes in the hope this will just go away. And they have to take responsibility for the situation, why else have they been elected if not to do so? 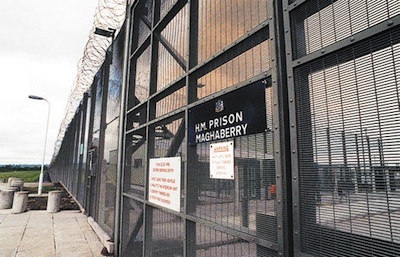 Whether we agree or not with the politics of those held in this gaol there is a basic onus, common to us all, as right-thinking men and women, that abuse of human rights not be tolerated. Human rights are sacrosanct. Silence equals complicity, toleration equates to association and facilitation. Who would honestly want to facilitate and be associated with this?